On the 29th August 2009 members of the University of Newcastle’s Coal River Working Party were invited to inspect the archaeological dig being undertaken on the site of the former Palais Royale (now KFC) site in Newcastle West. This is the second visit to to the site to speak with archaeologist Matthew Kelly (AHMS) who was overseeing the investigation of the colonial history of the site. The previous day was spent with archaeologist Alan Williams inspecting the Aboriginal heritage finds. 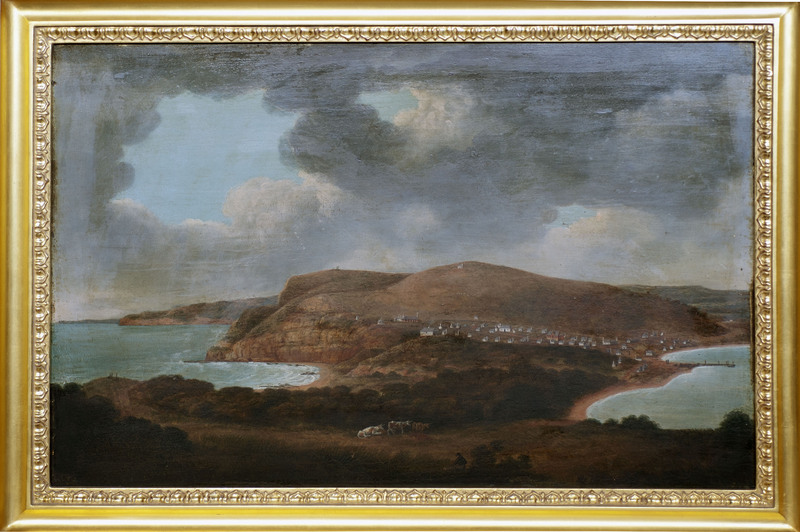 An early representation of the site can be found on this painting by Joseph Lycett, held in the Newcastle Gallery entitled “Newcastle, New South Wales, looking towards Prospect Hill.” circa 1816-1817. It appears as a small white dot at the right edge of the painting. 6. Demolition work undertaken on the former Palais Royale and subsequent damage to the site. We are very interested in learning more of the colonial heritage of the site that involves the clearing of the land in the 1790s, the establishment of the Government Cottage and farm (c.1810), Henry Dangar’s Meat Preserving Works 1848-c1854, the Elite Skating Rink, McLellan Hellyer & Co., leading up to the Palais Royale. Despite requests we are yet to see the second report of the archaeological dig encompassing the colonial history from this important site in Newcastle. Another ‘dig’ out the back may well uncover some chicken bones.